Try breathing underwater for the first time! Get your first taste of scuba diving and how to use scuba gear in a controlled environment. The basic principles and skills of scuba diving. All while under the supervision of a PADI professional! 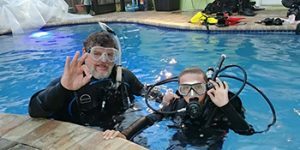 Although this is not an actual certification, Discover Scuba is a great introduction for those who don’t know if they are sold on the world of scuba diving. Also, if you do want to take the next step to get certified, the skills you will learn will carry over into Open Water. All the equipment is provided and anyone 10 years or older can participate! For more information on Discover Scuba from the official PADI website, click here. For more information or to book this course, please contact us at info@adventuretampa.com or give us a call at 813-832-6669.